The SQL TRY_PARSE is one of the SQL Conversions Function, which is used to convert the String data to requested data type, and returns the result as an expression. I suggest you to use this SQL TRY_PARSE function to convert the string data to either Date/time, or Number type. 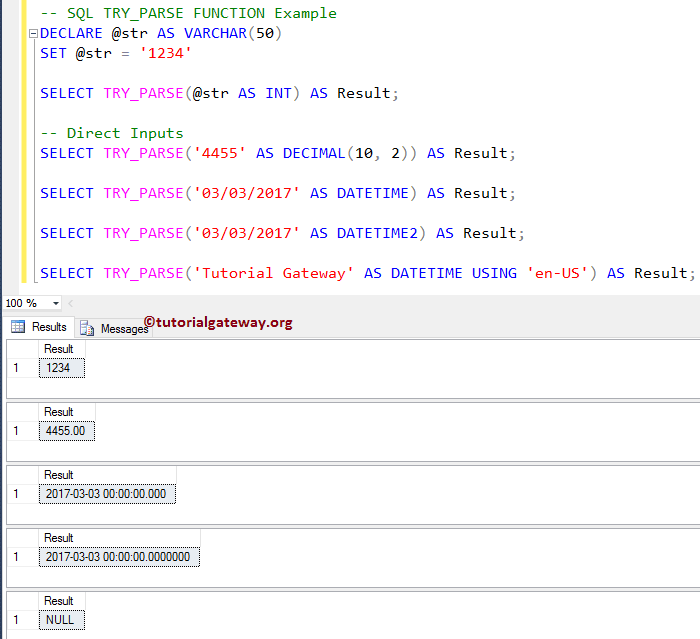 In this article we will show you, How to use/write TRY_PARSE in SQL Server with example. String_Value: Please specify the valid string that you want to convert as the desired data type. Culture: This is an optional parameter. And if you ignore parameter, then the function will use the language of the current session. TIP: If the Sql Try_Parse function is unable to convert the string into desired data type, or if we pass the string as non-convertible then this function will return NULL. The SQL Server Try_Parse Function is mainly used to convert the string values into date and time, and numeric values. The following query will show multiple ways to use this function. Below lines of code is used to declare a variables of type VARCHAR. Next, we assigning the string data ‘1234’. From the below statement, you can see that we are converting the string to integer. We also assigned new names to the result as ‘Result’ using ALIAS Column. Lastly we tried to convert the ‘Tutorial Gateway’ string to date time. As you can see it is not possible so, this Sql Server Try Parse function is returning NULL as output. In this example, we will show you, How to use IIF Statement to handle the NULLs returned by the SQL TRY_PARSE. This can be helpful when you are inserting records, and you don’t know whether the column has date and time or not. In this case, you can simply use this function to check, and if not we can replace it with the current date and time. Here we used the IIF statement along with the IS NULL statement to check whether the result expression is null or not.